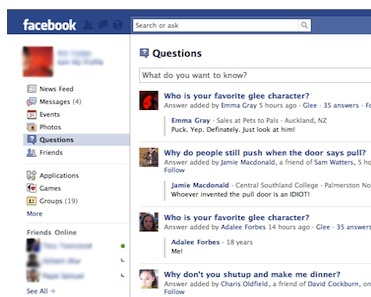 Are Questions The "Future Of Facebook"? A few days ago, Facebook opened up the private beta further and is now taking applications for anyone who wants to enter the beta. Facebook is taking its Questions product very seriously. 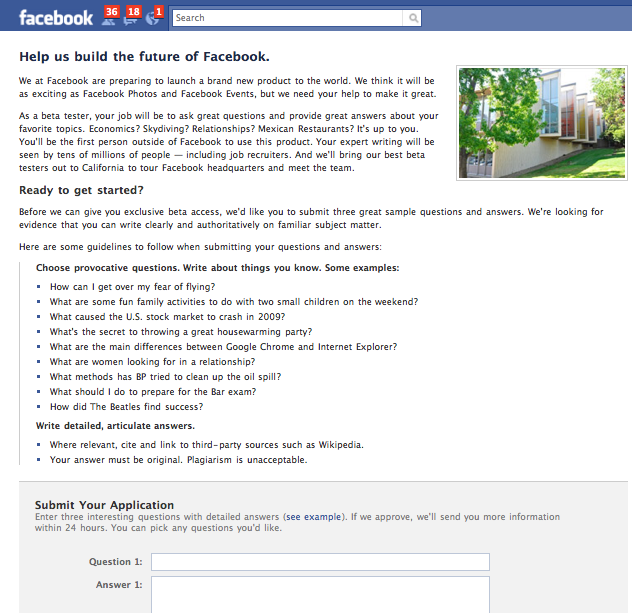 “Help us build the future of Facebook,” reads the title of the page. It puts the Questions product on par with Photos and Events. In one fell swoop, Facebook is about to take on Yahoo Answers, Google (via recently acquired Aardvark), LinkedIn (notice the reference to job recruiters? ), and Quora. Q&A sites drive massive pageviews. It is an area Facebook can no longer ignore. People already use Facebook informally to ask questions across their social network from time to time. It is a type of status update, if you think about it. The Questions feature will bucket all of these together, spread them across your friends and their friends, and make them searchable. The advantage Facebook could have in the Q&A space is that to the extent that you find answers from your extended social network, questions can become the start of deeper conversations and spur new relationships. But breaking it out as a separate feature raises some new questions. Will every major type of status update now become its own feature on Facebook (like Photo and Event updates do)? And, if so, what’s next?